This past Monday marked the launch of the 4th beer in Goose Island’s Fulton & Wood Series , Gran Gås (pronounced gu-az), which is Swedish for “Spruce Goose”. 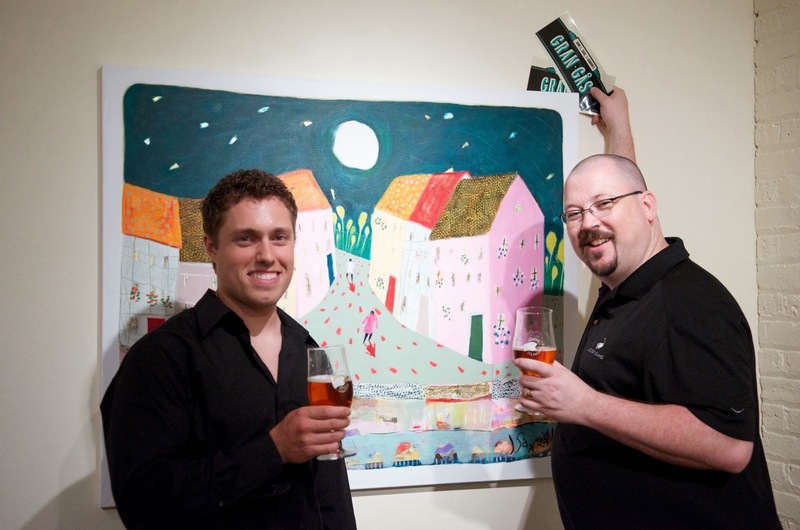 The launch party was held at the Swedish American Museum in historic Andersonville, the perfect location to introduce this Scandinavian inspired beer, brewed with lingonberries and spruce tips. The team behind Gran Gås was Senior Brewer John J. Hall and Brewer Zach Greenwood. We had the opportunity to sit down with John J. and Zach to get a behind the scenes look into the making of Gran Gås. H2TA: John J., for those who may not know you personally, tell us about your background. How long have you been brewing with Goose Island? John J: I’ve been brewing with Goose Island just shy of 15 years. I started off as a Cellarman, moved up to a Shift Brewer in the first year, spent 4 years on second shift and then moved up to Lead Brewer, Head Brewer and then Senior Brewer. H2TA: You’ve developed numerous best-selling Goose Island recipes such as 312 Urban Wheat Ale, Mild Winter Ale and the Harvest Ale, all very drinkable beers. How much do you keep in mind what consumers want in terms of a flavor profile? Or are you taking the opportunity to influence with your own tastes? John J: The concept of 312 was Greg Hall’s idea. He said, “I want an unfiltered beer, with citrus notes”. Beyond that, honestly when I’m trying to design a beer I think of a flavor I want to achieve, that I want to drink and hope that everyone else is on board. I don’t try to make beer for “the people”, I try to make a beer that I want to drink and hope they all agree with me. H2TA: Tonight we’re celebrating the launch of the 4th beer in the Fulton & Wood Series - Gran Gås (aka Spruce Goose). What a great name, by the way. Can you tell us what inspired this recipe? John J: We started this whole program of Fulton & Wood Series innovation beers pairing up brewers who hadn’t worked together before. So in my case it was myself, a senior brewer and a new brewer, Ross Allen. One thing he had in mind that we both agreed on was taking our Belgian yeast (Golden Ale) and adding cranberries to it. I had just come back from a trip to Ireland. My wife Margie and I were having breakfast in Dublin and the side of her plate was garnished with lingonberries (a small berry from Scandinavia). I had never seen them before. I don’t eat berries but tried one and thought it tasted like a tart cranberry. So when Ross mentioned cranberries I thought that lingonberries could be a little more unique and obscure. Ross was rehired back by his old company and Zach and Gordon were added to the program. We now had a Belgian beer with lingonberries and started thinking about what else says “Scandinavian” and came up with spruce tips rather than hops, for aroma. That’s how it started. H2TA: What is involved in brewing with lingonberries and spruce tips? And where does one source such unique ingredients? Zach: We did benchtop fermentations, so we had Gordon make a few variations with different additions of spruce to smell, taste and determine the quantity we liked to scale up from. With the lingonberries we did something similar using Green Line base beer. We mixed in some berries until we achieved the ruby color and flavor we were looking for. The spruce tips were put in mesh bags and added to the whirlpool for 30 minutes. After fermentation the beer was racked over 700 lbs of berries which we puréed ourselves and then aged for 3-5 days. John J: Once I had the idea to use spruce tips, the question was where to get them. I was hoping to find them locally grown and harvested from a Christmas tree farm. I searched around and found a few places that were interested in the idea, but the one last question I asked was, “Do you use chemical treatment on your trees?”, which they did. I found a company in Colorado, Spruce on Tap, a husband and wife team. They were picking them for local homebrewers and small brewpubs in small 2-3 oz packages. I called asking for 80 lbs, which then turned into 220 lbs. Randy Stowes and his wife went out and picked them over the course of 2-3 weeks, in between all of the forest fires in Colorado, and were able to find enough for us. They hand-picked, collected, vacuum-sealed, put on ice and shipped to us directly and we were brewing with spruce tips the next day. I had never brewed with lingonberries or spruce tips before and had no idea how to use them. Having Zach and Gordon with lab backgrounds was phenomenal. When we first started brewing the trial batch, a new lab person, Dennis McCarthy chose to figure out on his own the bittering value the spruce would add and he achieved it. We got within .04 of our target. It’s innovative folks in the brewery all around that make this happen. Gran Gås would not be possible without the hard work of Zach, Gordon and Allen Ross. This was a collaborative beer that we all did together. I added a few ingredients but I could not have done it without the lab helping me figure out how to make this beer. It’s a great tool that Goose Island has. H2TA: Is Gran Gås going to be available to the public anytime soon? John J: We’re releasing these like all of the other Fulton & Wood Series. There are about 30 or so really good craft beer bars in the Chicagoland area. Within two weeks you’ll see Gran Gås at select bars, on draft only, until it’s gone. It will probably last 90 days or so in the marketplace. H2TA: The whole Fulton & Wood Series of craft beer is an amazing concept. Every creation seems to be getting a little more complex. In your opinion is it complexity, or just an exciting mix of fresh ingredients that draws so much interest? John J: I think it’s a bit of both. The next beer on the line is “Casimir”. The brewers are using Polish hops, which we’ve never had in the brewery before, and caraway seeds. What’s really critical is Goose Island’s open-mindedness to whatever our ideas are. They’re not going to knock us down for being too weird or expensive if we think it’s a good idea. They’re behind us and will spend the money to make it happen. Fulton & Wood is about Goose Island’s commitment to expanding the boundaries. H2TA: How much does the limited draft release aspect of the series add to your creativity versus a beer that has to be bottled and distributed? John J: It expands creativity because we can turn around a new beer, a new idea relatively quickly and we only have to do it once, which means the next beer has to be on line right behind it. There’s a set timeline. We’re going to keep putting these fresh beers out as fast as possible. H2TA: It seems many breweries just order their ingredients from their distributors. Do you feel that you’re inspiring a lot of these new breweries in terms of using fresher ingredients in the brewing process? John J: I’d say yes. Even before this idea, Goose Island has been barrel aging different beers for years, buying fresh fruit from Michigan’s farms and local farmer’s markets. If we need to do something more extensive like lingonberries we’ll go further abroad. One of our brewers had an idea to brew with mission figs (Fulton & Wood Black Mission) so we found mission figs in California and made it happen. We are open to anything – Goose Island is great for that. H2TA: Speaking of other great breweries John J., we understand that you’ve recently accepted the position of Head Brewer with 5 Rabbit Brewery, congratulations! Can you tell us a little bit about what you’ll be doing there and what the future of 5 Rabbit looks like from the Head Brewer’s perspective? 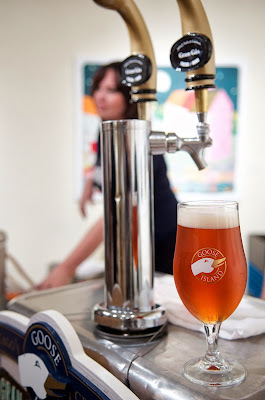 John J: Well, hopefully very similar to what I’m doing here at Goose Island – but expanded. I have a role at Goose Island that is very broad but I am primarily responsible for raw materials and production of the hot side of brewing. At 5 Rabbit I will be in charge of that plus the cellar, the aging, and packaging, so it’s an even broader role. I’ll also get to work with Randy Mosher who has written some phenomenal books on brewing, which is a great experience for me. This was a great opportunity when it came up, so even though I love Goose Island I just couldn’t pass it up. Tack (“Thank You”, in Swedish), John J and Zach! If you’re thirsty for more Spruce Goose, check out the team’s Youtube video!